With this first snowfall I thought it might be appropriate to write about something that is more closely associated with snow. This idea led me to thinking about owls even though many owls do not like snow too much and migrate to warmer places. These mostly nocturnal birds have been mentioned in literary works for many centuries and in many cultures with the most recent example at the beginning of the first book of the Harry Potter series. Why? Owls have several characteristics that captures man's attention and imagination with the most important one being its ability to function at night, something man cannot do without technological help. When one throws in the owl's ability to fly absolutely silently and its unique hooting call into the mix, humans give the owl a kind of uncomfortable and grudging respect. Finally, owls are the only birds that have their eyes placed directly in front providing them with binocular vision making them more effective hunters. This placement of the eyes closely resembles that of humans thus the owl has acquired the reputation of being wise even though it is not too bright as far a as birds go. For a more detailed discussion of the unique characteristics of the owls refer to Article No. 35. There are ten, yes ten, species of owls that can be seen in our area at one time or another depending on the time of the year and the kind of year it has been weather-wise. Of the ten species, two are year round residents; five are summer residents that migrate south for the winter; three are permanent northern residents that periodically show up (irrupt) out of their normal range in the winter. Of the last three, only the snowy owl is commonly irruptive and can be expected in our area every two or three years or so. The other two can be expected only once or twice every several decades. Because I have no photos of any "winter" owls I chose to write about a common, but seldom seen, nocturnal little owl, the Northern Saw Whet Owl. 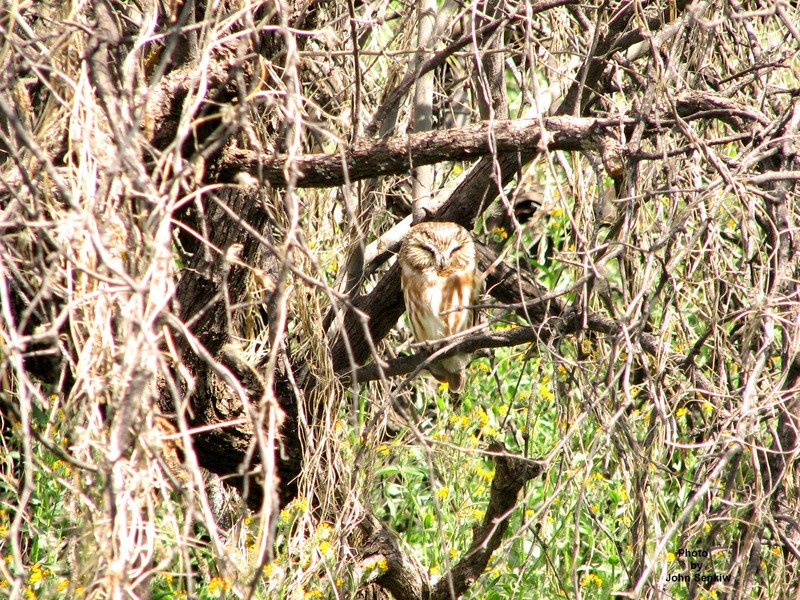 It is one of the smallest of owls and definitely the smallest one that we will encounter in Saskatchewan. How small? A robin is about 10 inches in length; the Saw Whet is only 8 inches long but with a shorter tail. Try and imagine a big headed brown robin streaked with white. Because of their small size, nocturnal habits and migratory nature Saw Whet Owls are seldom seen by man. Early European settlers gave the owl its name after the sounds it makes which is a raspy toot repeated about twice a second and reminded them of the sound made when sharpening (whetting) a saw. I have sharpened saw blades but have never heard a Saw Whet owl call so I cannot comment on the matter. The first time, and for many years the only time, that I saw a Saw Whet was an encounter with a flock of six one summer when I was about 12 years old. The owls were perched in trees near one of our sheds and just kept sleeping soundly completely oblivious to our stealthy approach so as to get a really good up-close look at them. There was no need for caution as the owls were very tame allowing us to come right up to them, pick them up from the trees and then carry them around. My two younger brothers and I "played" with them the whole day being very careful not to hurt them in any way. Strangely enough the owls did not seem to mind the experience at all. One time one of the owls that was sitting on my finger managed to clamp down rather hard and stick one of its claws into my skin. I instinctively jerked my hand back owl and all. That was not a wise move as the little owl then really clamped down on my finger, as if holding on to struggling prey, causing me some real pain. Realizing what had happened I forced myself to relax and the owl let go of my finger. We were hoping to see them the following day but they flew away during the night putting an end to that little episode. They certainly were cute. For many years I thought the six were a family group of two adults and four young but that was not the case as all six were medium brown in colour streaked with white which indicates adult birds. Juvenile birds are a dark chocolate brown that are so completely different from the adults that for many years they were thought to be a separate species, the Kirtland's Owl. Furthermore owls rarely, if ever, rear four young with two being the norm. This week's photo was taken in a desert park near Tucson, AZ. 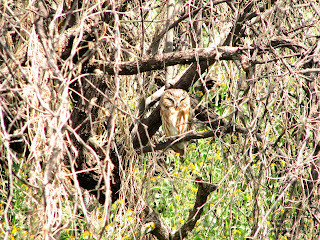 The Saw Whet is a permanent resident in northern Arizona but is a rarity where it was seen. Needless to say it caused quite a stir among local birders.